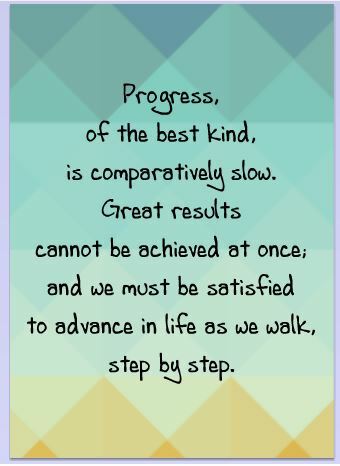 I know why Samuel Smiles…because he’s learned that progress takes time, patience and baby steps (well maybe just small steps). For those of us who want to make progress, but yearn to achieve it in leaps and bounds, this is a great reminder. Slow and steady wins the race as in the story of the turtle and the hare (turtle wins the race) comes to mind when I think of the above quote. I guess in this day and age, we are all tethered to instant gratification and the quick and easy way to success. Gone is patience and accepting the time it takes to make something happen. Instead of being in the step by step progression and enjoying the trip, many people abandon the task if it ‘takes too long’ in their minds. We are all victims of this in different ways. Media has shown us those quick fixes which make laborious steps fewer or even obsolete. Ads to lose weight faster, to clean your home quicker, to do your banking easier, to get the answers now and so on come at us everyday in all different ways. Not that I’m looking to do more work or have my work take more time, but really? What ever happened to the feeling of accomplishment, of presence in chopping vegetables or growing your own anymore? Or in any task? I’m just saying that there’s an awareness in being present and a centered feeling in accomplishing something all while remaining present. Does this make sense to you?